Tauchen Sie ein in die mittelalterliche Geschichte der Stadt Sevilla, während dieser 1,15-stündigen Tour durch das jüdische Viertel der Stadt und erleben Sie einige der antiken Denkmäler. Begeben Sie sich zurück durch die Zeit nach Santa Cruz, einem der ältesten Viertel Sevillas, während Sie durch die engen Straßen schlendern und genießen Sie den wohlriechenden Duft der einheimischen Orangenbäume. Während Sie zu Fuß weitergehen, sehen Sie auch die Fassade von Sevillas Alcázar (Königlicher Palast), abgenutzten römischen Säulen, den Alfalfa-Platz, Plaza San Francisco, und vieles mehr. Ein ortskundiger Reiseleiter hilft Ihnen weiteren Kontext zu Ihrem Spaziergang zu erlangen. Lara was a great guide—knowledge and entertaining. She’s a jewel. It was a pleasure to have her show us the old Jewish sector. This tour took us to out-of-the way places that we wouldn't have seen on our on. It was a short tour but well worth the price. Our guide was very knowledgeable about the area and easy to understand. I ended up having a private tour since no one else signed up! I can't remember my guides name, but she was wonderful! She was so knowledgeable in all topics discussed and made the tour really interesting. Wonderful tour, I thoroughly enjoyed this tour around the Jewish Quarter with a lovely knowledgeable and enthusiastic guide. We were a group of 7 adults, and all of us thoroughly enjoyed the tour of the Jewish quarter. Because there is littlle remaining from before the inquisition we were told not only about the history but also interesting stories about families who lived in the Jewish Quarter. 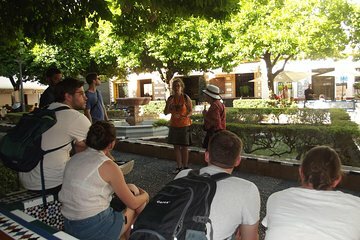 Our tour guide, Rocio, was enthusiastic, knowledgeable and spoke English well. We needed to catch taxis to Carmona and had to cut our tour short by a few minutes. Rocio felt badly that we were missing out on the last couple of stories. Visitar a Juderia com uma guia nos fez caminhar pelas ruas estreitas e aprender detalhes que facilmente passariam despercebidos em uma caminhada ao acaso. Highly informative tour through this special area of Seville. Our guide was amazing.